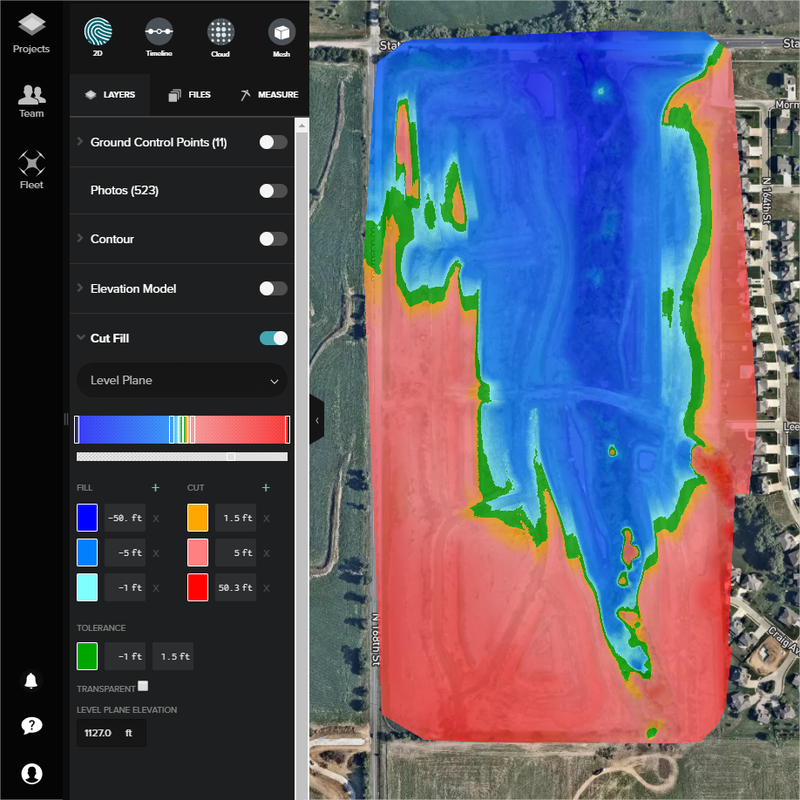 You can calculate Cut/Fill information using your drone data for the entire site or for a specific area, using LandXML files. Set as many ranges as you need to see areas of CUT or FILL. Each range can have a different color assigned. You can use the slider or enter the elevation ranges manually. You can change the opacity by using the slider below the color ranges. The first tolerance values corresponds to FILL, while the second one corresponds to CUT. You can either set the tolerance range to be transparent (default) or have a solid color. You can choose what you'd like to compare the Cut Fill tool against: your level plane, a previously uploaded XML file, or a previous flight. These different options will help you better understand the progress of your site. By default, it uses the median for the minimum and maximum elevations. 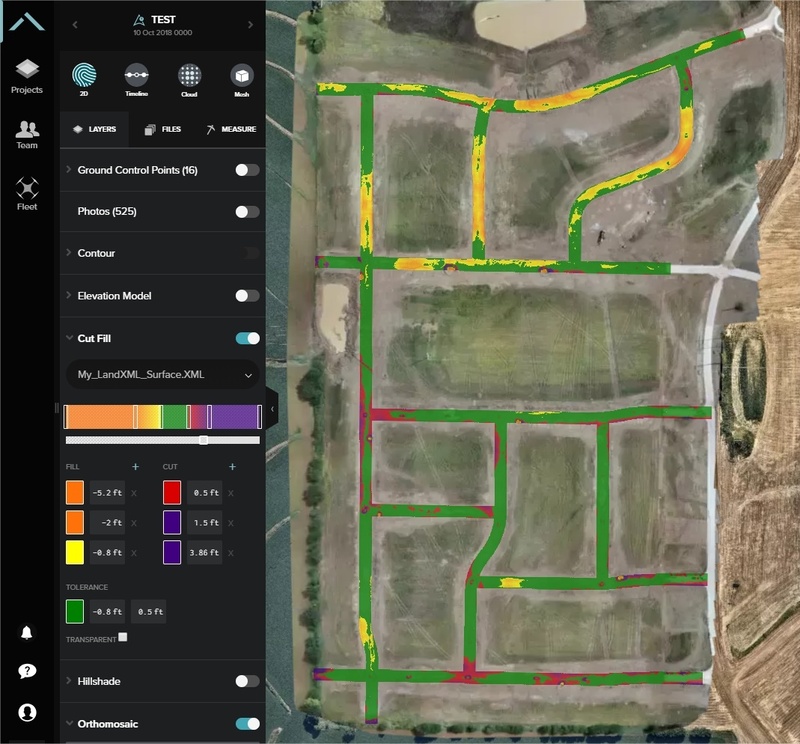 To improve the accuracy of your measurements, Site Scan allows you to import your own surface in LandXML format, which can be used for volume calculations and the Cut/Fill map. You can use any files you've previously uploaded into Site Scan to compare reality to design by selecting File from the comparison dropdown and then selecting the specific XML file you'd like to compare to. If you have other processed flights in your project (ideally processed with GCPs, so they line up perfectly), you can use the Cut Fill tool to compare the progress from one to the other. Use the Overlays screen to upload your LandXML File. You can upload as many LandXML files as you need, and once they're in Site Scan, you will be able to select them from the Cut/Fill drop-down menu. If a coordinate system is not embedded in the file, you must manually enter its EPSG code (typically the same as your Ground Control Points' coordinate system). We do not support surfaces georeferenced in a Custom Coordinate System at this time. The newest addition to the Cut Fill tool is the grid view. Make sure you have beta mode enabled to test it out. Turning on the grid toggle will allow you to visualize the elevation data difference within a grid layout. You can also turn on the actual elevation numbers, as well as the the volume of each grid (in cubic yards). The bottom right section of your screen will display the elevation delta of the point the cursor is hovering over.